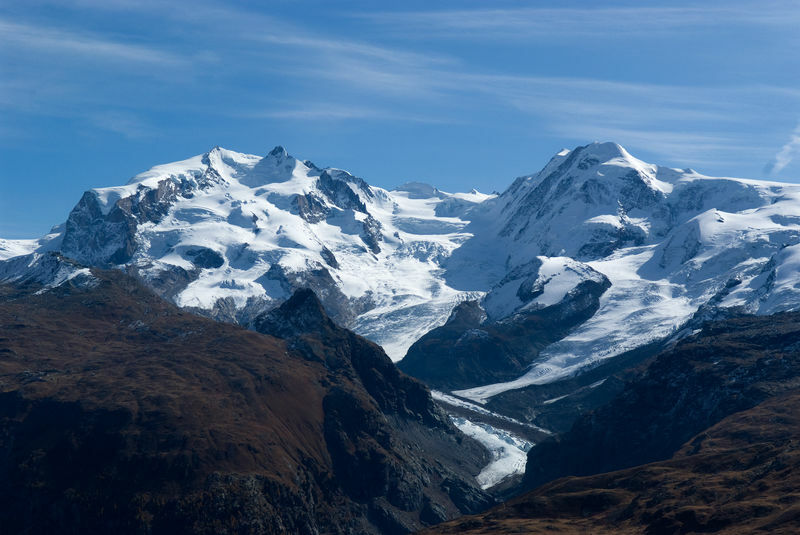 The Monte Rosa massif, flanked by glaciers, is the highest mountain in the Swiss Alps. Depending on the method of counting, it has ten peaks higher than 4,000 m, and lies partly in Italy. The Dufourspitze (4,634 m, right, black rocky crest) in the Monte Rosa massif is Switzerland’s highest peak. 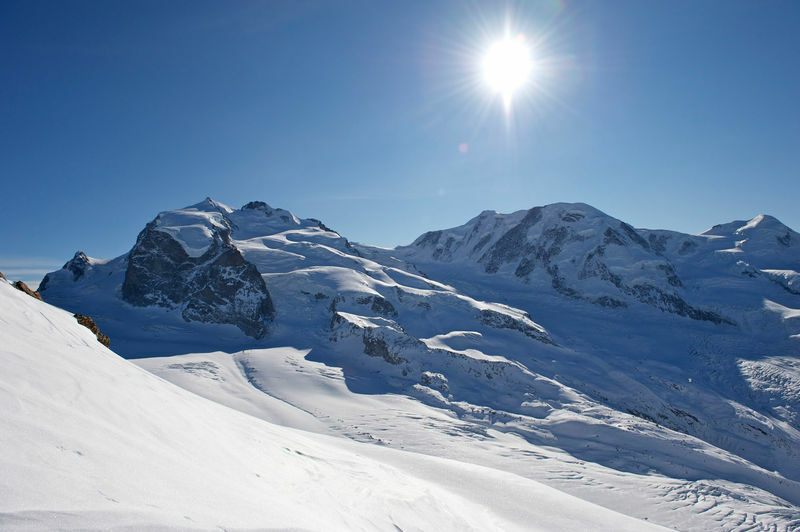 The Dufour peak is the highest summit in Switzerland and one of the ten main summits of the Monte Rosa massif. Its rival is the Dom, the highest mountain located entirely within Swiss territory. 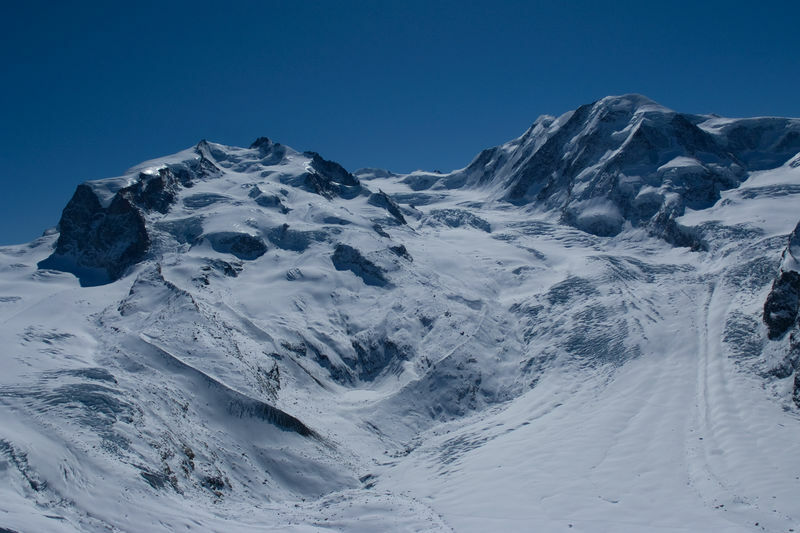 The 150th anniversary of the first ascent was celebrated in 2005: Federal Councillor Joseph Deiss, together with Zermatt mountain guides who were descendants of the first conquerors of the mountain, climbed from the old Monte Rosa cabin to the peak in a seven-hour tour. There he met up with the Italian minister of agriculture, Giovanni Alemanno. 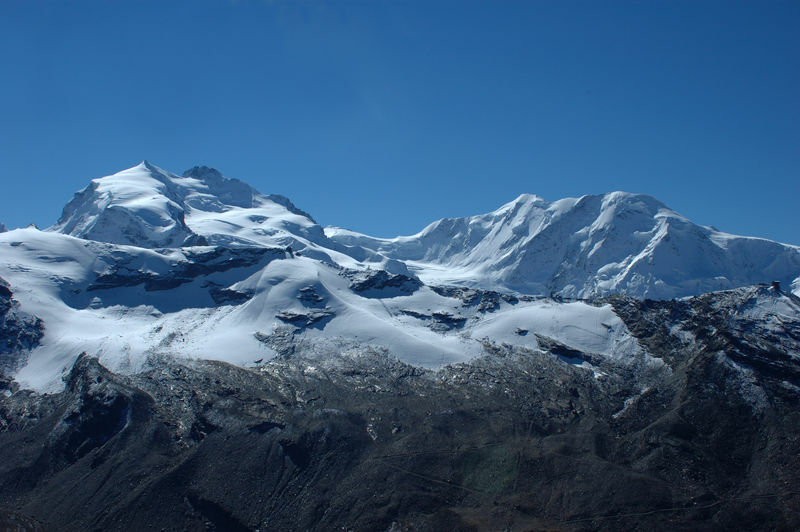 The Monte Rosa massif has about ten peaks higher than 4,000 m: Dunantspitze (Ostspitze), Dufourspitze, Grenzgipfel, Ludwigshöhe, Nordend, Parrotspitze, Schwarzhorn, Signalkuppe, Vincent Pyramid, Zumsteinspitze. The Dufourspitze, most clearly seen from the Swiss side of the border, was earlier known as the Gornerhorn but was renamed in honour of the Swiss general Guillaume-Henri Dufour. The massif itself has an Italian name; no German name exists. However, the individual summits all have German names; some additionally have Italian names, although these are mostly Italianised versions of the German originals. The same is true of the summits lying entirely within Italian territory or accessed from the Italian side of the border, such as the Zumsteinspitze, Balmenhorn, Vincent Pyramid and the Liskamm. The reason is that since the Middle Ages, the valleys around the Monte Rosa have been inhabited by German-speakers: either people of the Upper Valais or, in the case of individual villages and all three valleys on the Italian side of the border, by Walsers (Highest Alemannic dialects). 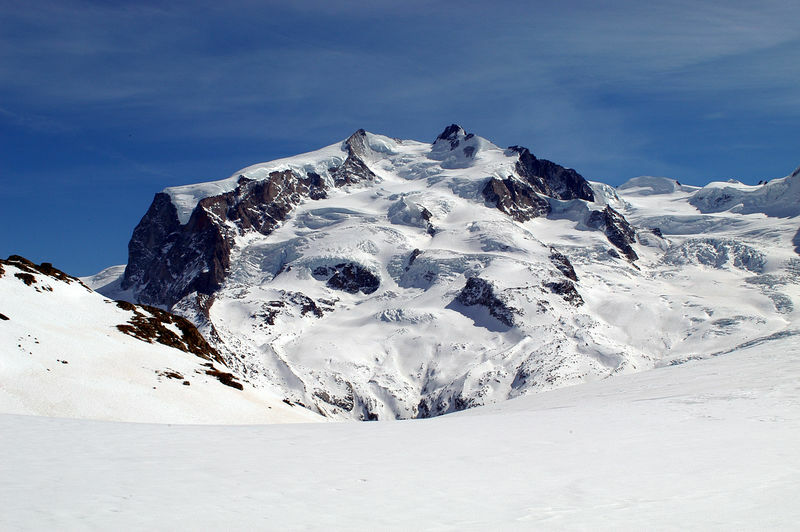 These people evidently named the individual peaks; however, it is when viewed from lower-lying Italian regions that the Monte Rosa has the appearance of a single unified massif. The first ascent of the highest point, the Dufourspitze, took place on 1 August 1855 by a rope team led by Charles Hudson. Hudson was subsequently a member of the team that completed the first ascent of the Matterhorn in 1865 – and one of the four climbers who fell to their deaths during the descent. On the Dufourspitze, Hudson was accompanied by John Birkbeck, Edward J.W. Stephenson and the brothers Christopher and James G. Smyth.